Wests Tigers 26 (Ally Beaufils, Janaya Bent, Litiana Smith-Warwick, Sophie Curtain, Brooke Gray tries; Emily Curtain 3 goals) def. St George Dragons 24 (Mareva Swann 2, Camelia Atelaite Ali Lotoa’atu, Hana Herlihy, Haylee Hifo tries; Sereana Naitokatoka, Charkyl Ngamotu goals) at Mascot Oval. Illawarra Steelers 56 (Maddison Weatherall 3, Keele Browne 2, Olivia Vale 2, Tiana Graham, Rhiannon Tungai, Emily Andrews tries; Tiana Graham 4, Viena Tinao 4 goals) def. Cronulla Sharks 14 (Millie Graham, Kyla Johnston, Jaida White tries; Lynda Howarth goal) at Shark Park. 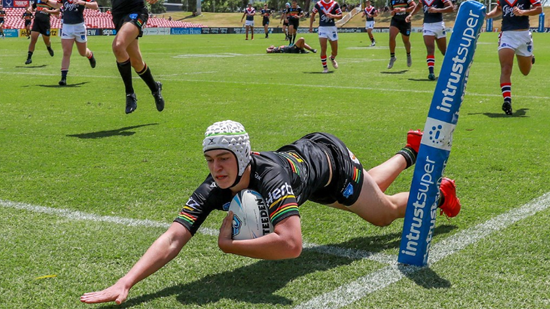 Penrith Panthers 28 (Emelia Kaafi 2, Hope Tevaga 2, Litiana Tuifua, Hayley McGregor tries; Litiana Tuifua 2 goals) def. Sydney Roosters Indigenous Academy 10 (Brandi Davis-Welsh, Zali Dymock tries; Dakota Blacklock goal) at Panthers Stadium. Newcastle Knights 58 (Carissa Harrison 2, Jorja Holden 2, Caitlan Johnstone 2, Lily Hanning, Terri-Lee Van Wyk, Jada Beale, Kayla Romaniuk, Joeli Morris tries; Caitlan Johnston 5, Tanaya Millar 2 goals) def. Canterbury Bulldogs 0 at Belmore Sports Ground. Parramatta Eels 32 (Tehiainu Raibevu 2, Shondell Akhabue, Tahlia Alexander, Allison Futialo, Martha Fua tries; Allison Futialo 3, Breeze E’e goals) def. Canberra Raiders 14 (Gabbie Davis 2, Klaudia Osztrenkovics tries; Krystal Blackwell goal) at Raiders Club Belconnen.